Reason is still a viable all-in-one solution for those who don’t own it already, but v10 feels like a very minor upgrade for power users. Grain is a fun, transformative tool. SoundIron’s instruments - particularly Klang - can be inspiring devices. Europa has unique talents and sounds. Europa and Grain share the same bottom half. In 2017, Propellerhead announced that it was bringing onboard the private equity firm Verdane Capital. You’d forgive us for thinking that this meant a Mitt Romney-style dismantling of assets and slow sell-off of the legendary Swedish developers, but in May we realised this might not be the case, as Reason finally did the unthinkable, changing the tack of 17 years and integrating VST plugin support into the staunchly-one-format DAW for version 9.5. Version 10 marks the first whole-version upgrade since these events, and it might be the true litmus test for what the future of Reason could be. Anyway, this isn’t The Economist - let’s check out Reason 10! Five all-new instruments have been added to the rack, and two previously paid-for REs are now built-in for free: Radical Piano is a piano modeller for mixing and matching acoustic models into a custom patch, and Synchronous offers four effects controlled by custom-drawn LFOs, for rhythmic distortion, filter, delay and reverb. There’s also a bunch of new sounds in the form of the included Loop Supply and Drum Supply packages. Depending on the type of producer you are, the new soundware will either prove to be an inspiration or a permanent blight on your hard drive. Fortunately, the new content is optional, though, and we can’t fault the quality of the sounds themselves, so better in than out, we say. So version 10 is about additions. With the exception of a Content Manager to organise your soundware add-ons, and a new favourites function in the browser, Reason itself hasn’t changed. So how decent are the instruments? First up is Europa. Seemingly positioned as the jewel in Reason 10’s crown, this wavetable synth seems to be a direct response to legendary megasynths like Serum and Massive. Its three ‘Engines’ combine wavetable oscillator, spectral filter and unison modules, which are then piped through a master filter and amp envelope. Europa’s stock of waveforms includes plenty of analogue-style entries, (Saw-Triangle, Pulse Width), and a few more interesting options (Karplus-Strong, Vocal Cord and more), but there’s a distinct lack of actual wavetables in the traditional sense - and you can’t import your own wavetables - so Europa feels a little lacking in this regard. The per-engine Spectral Filter, on the other hand, is no slouch, giving plenty of interesting options for sonic sculpting. Europa has four envelopes (these are loopable and can be custom-drawn) and three LFOs. Modulation is assigned via a matrix that’s eerily close to the one we know from Thor, and gets the job done, but the lack of drag-and-drop modulation is conspicuous by its absence here in 2018. Elsewhere, the synth is rounded off by a choice of six reorderable effects - Distortion, EQ, Modulation, Compression, Delay and Reverb. In use, Europa sounds epic in a ‘Reason’ way, with results ranging from thick poly patches and EDM supersaws through to realistic metallic plucks, evolving soundscapes, electro bass complexity and much more. The other new Propellerhead-designed instrument in Reason 10 is Grain, which brings granular sampling to the DAW. Load in a sample - alas, just one sample per instance - and Grain extracts small snippets of the audio and plays them back. You can govern Grain’s playback in several ways: choose one of four playback styles; dial in granular characteristics such as grain size, repeat rate, crossfade, etc; apply Jitter to modulate playback; and control the playhead’s position using Envelope 1 (another draw-your- own affair). There’s also an additional simple oscillator onboard to blend with the sound for thickness. Loading a new sample into Grain retains the rest of the device’s settings, but for an instrument so... er, engrained into its DAW as is Grain, it’s a shame that you can’t drag in audio clips directly from Reason’s sequencer. Reason 10 brings us three sampled instruments from SoundIron. In contrast to the futuristic new synths, Humana, Pangea and Klang add some acoustic instrument sounds to the bargain. First up is Humana, a ‘vocal ensemble’ instrument that spits out sampled male and female “ooh” and “ahh” sounds - although we’d like more vowels in stock. It’s not what you’d call an ‘everyday’ instrument, but for a splash of sonic humanity, it hits the esoteric spot. Pangea, meanwhile, is a multisampled collection of 11 rare instruments from around the world. Again, these probably won’t appear in your everyday club bangers, but they can provide some crucial inspiration when you’re running dry in the heat of production. Then there’s Klang, which features ten multisampled tuned percussion instruments, and feels more relevant and well-suited to Reason. As a source for metallic percussion, it’s good fun to play with, and feels more sonically versatile than the other two instruments. All three instruments feature the same layout, with performance, filter, amp, delay and reverb modules flanking the parts of the interface that actually differ - the sound-generation modules. In these, you get the standard sampling functions of Start time and tuning. Imagine Klang, Humana and Pangea as ID8’s more culturally-inspired cousins, and you’ve got the right idea. Graphically, Grain is far more on-point than anything else in the collection, toting no-nonsense flat graphics, with just enough of the look of real hardware to keep things enjoyable and realistic. Modulation-wise, you get the exact same envelopes, LFOs, Thor-style mod matrix and effects from Europa - although this uniform approach is a good thing for Reasonists, we can’t help wishing for something a little less ‘cookie cutter’. But sonically, Grain is on point, capable of metallic sample-mangling, glitch-heavy stutters, complex pad design and other esoterica. Europa and Grain are joined by the decent SoundIron sample-based instruments, which offer a similar proposition: three different sound generators each flanked by an identical Filter, Amp, Delay and Reverb combo. Considering the small number of sounds available in each, it’s not a stretch to consider Klang, Humana and Pangea as one instrument split into three. 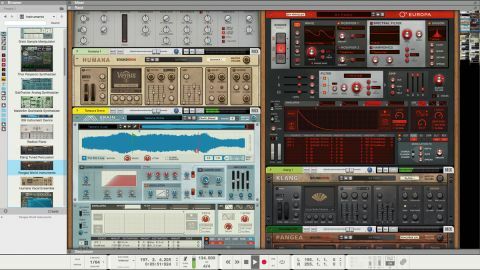 For newcomers to music production, or those on the lookout for a virtual studio that comes with everything you need to make music, Reason’s still a great option thanks to its hardware ‘rack’-inspired interface and raft of bundled devices. And, of course, it’s now free from its self-contained shackles thanks to the much-heralded VST support from v9.5. Yay! Yet, for a major DAW update, it feels as though this instruments-only upgrade has fallen a little short of the mark in comparison to previous updates. Beyond new synths, samplers and content, there are tons of minor niggles that still haven’t been addressed: more mixer options, automation curves, quicker call-up of VSTs, and a new take on the multiple views are just some of the things we were hoping for. Existing users considered, it’s hard to recommend this upgrade for all but the most die-hard Reason-heads, especially with the wealth of third-party VST plugins and Rack Extensions that are available for the same money as (or less than) this particular upgrade.